Manage all aspects of your class faster and easier than ever before for 100% free! Just signup and enter your classes and students to begin tracking attendnce, messaging students and parents, and assessing student progress all from one place. You can add as many classes as you want to manage for free and keep track of everything you want to as well as report on all activity in minutes. Faster and easier to use than any other solution, especially pen and paper or spreadsheets. Keep track of as many classes as you want all in the same place. Integrated reporting to get all of the information back for each of your classes easily. With the recent updates I made to MyAT, I added a whole new way to view, track and manage everything at the class level. Reporting of each class is easier than it has ever been before and the class list page and dashboard make it fast and easy to see your information and enter data at the class level. MyAT has users tracking student success for classes of any kind including college courses, elementary and highschool classes, church groups, yoga and fitness classes, child care facilities and even employers. Try it out for your class today and let me know what you think. 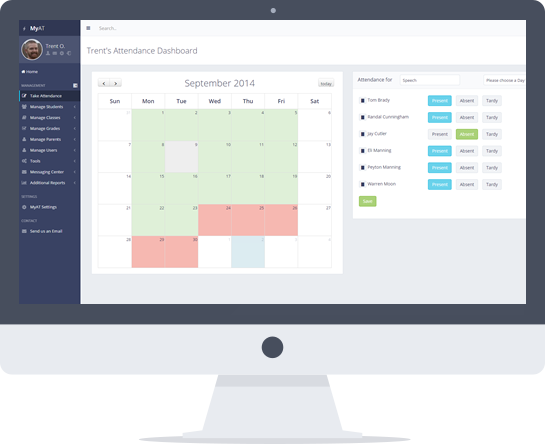 I built MyAT to help my wife take student attendance in her classroom. She needed something online and more easy than using paper or spreadsheets that she could use from anywhere. Since I launched it for her years ago it has grown and grown and is now being used by over 50,000 teachers, church groups, and event organizers to track over 650,000 students. Sign Up For 100% Free Now!